Authorities in Bangladesh appear to be winning the battle to stop people from urinating in public by putting up signs in Arabic, which is regarded by Muslim Bengalis as a sacred language. Although most Bengalis are not even able to read Arabic, the recent decision of the Religious Affairs Ministry to put up signs telling people not to pee in public seems to be working. A two-minute video clip has gone viral and is being shared on social media, including Facebook. It shows a group of people approaching a public wall to take a leak, but then as soon as they read the Arabic sign they make sure their flies stay zipped and make a pious gesture in respect to the Arabic language. Arabic is sacred because it is the language the Koran is written in. Similar signs in the Bengali language were having little effect. “I don’t understand why people urinate by the roadsides. Especially when every mosque provides public toilet facilities,” Matior Rahman, the country’s religious affairs minister, says in the video. A spokesmen for the religious affairs ministry said the campaign had been a success. 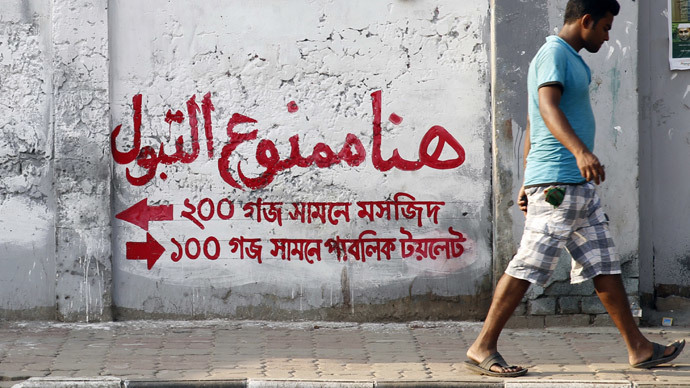 “We took the initiative to erase the warnings in Bangla language against urinating in public and instead wrote the same message in Arabic, you can see the result yourself – it appears to be a successful campaign so far,” he said. But it has received harsh criticism from Fariduddin Masud, a well-known cleric, who said it was running the image of Arabic. “Nobody has the right to use the language of the Koran for such a campaign. The people of the country respect Arabic but that does not mean that we’ll tolerate the use of Arabic to stop people from urinating [at street corners],” the cleric said, according to online news portal Natunbarta.com. The Arabic initiative comes five years after authorities in Dhaka, Bangladesh’s capital city, installed over 100 mobile toilets to try and stop people from defecating in the open air.